Kevlar’s First Motorcycle (sort-of) – The Bobcat created a place for Kevlar in a very active family. He developed independence and experienced friendly competition with his three brothers. 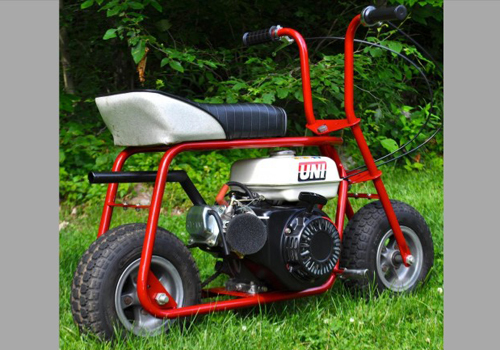 It was never classified as a motorcycle, more like a Lil Tykes rendition of a fat-tire, 5 horse power mini motorcycle. You see, as my memory is coming back to me, I must have been about five or six years old. The “mini bike” as the Kesler family called it, was better known as the Bobcat and was transferred to me like a comfortable pair of jeans handed down from an older sibling. This was my very first motorcycle/mini bike and it was now my turn to ride. I don’t really remember much, other than the huge orange speckled helmet my dad made me wear, and crashing a lot. I am thankful for the helmet since I crashed a lot those first few weekends, and let’s not forget the bruises. But, there was also the never-ending smile that still dons my face some 40 years later. The Bobcat made me mobile and I could ride with mom, dad, and my three brothers. The Kesler family was very active; we camped and rode motorcycles almost every weekend and with the Bobcat I had my own two wheels and a voice at the evening campfires when we talked about the day’s adventure. I also had a means to antagonize and compete with my slightly older brother, Larry, who handed down the Bobcat to me and moved on to the Rupp. I sure do miss those days and am thankful for my father’s teaching and the Bobcat’s first riding sensations. My childhood memories of family, love, and fun centered around motorcycling.